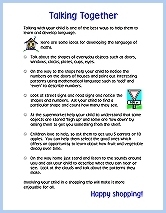 We value the input parents have in their child’s learning and are keen to support learning at home. 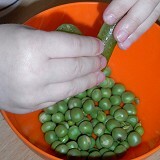 If you know your child has enjoyed a particular activity at nursery you may be able to borrow the resources so you can play again at home. If English is not your child’s first language then try to encourage them to use both English and your home language during play so they will develop a good understanding of both languages. Here are some ideas for activities and games you can do with your children at home. 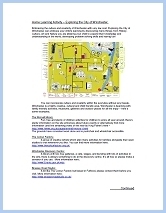 (Click on the images to open the pages). 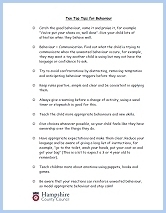 Ten top tips for behaviour. 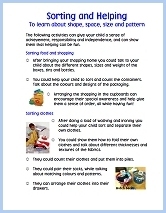 Asking your child to help with sorting the shopping and washing can give them a sense of achievement, responsibility and independence and can show that helping can be fun. Exploring Winchester can embrace your child’s learning by discovering from history, culture, art and nature you allow your child to expand their knowledge and understanding of the world whilst having fun. 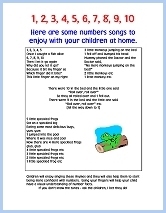 Children love to sing and join in with rhymes so try out these number songs to help your child develop confidence with numbers. 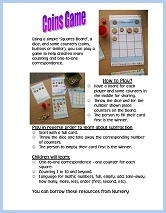 Using a simple ‘Squares Board’, a dice and some counters you can play a game to help your child learn counting and one-to-one correspondence. Pull up a step and get your children involved in cooking. They love it. 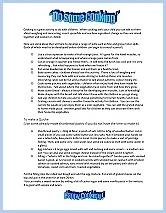 Here are some simple ideas for how children can help prepare food and learn about number and volume, pattern and change, and develop their physical skills. Ways to make a trip to the supermarket more enjoyable and use it as an opportunity for learning about shapes and numbers. Pattern seeking and creating is an essential part of human thinking and learning. 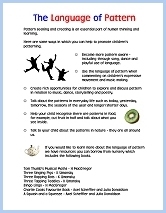 Here are some ideas for promoting patterning awareness in children.